Bagels. They’re my favorite bread-y thing. 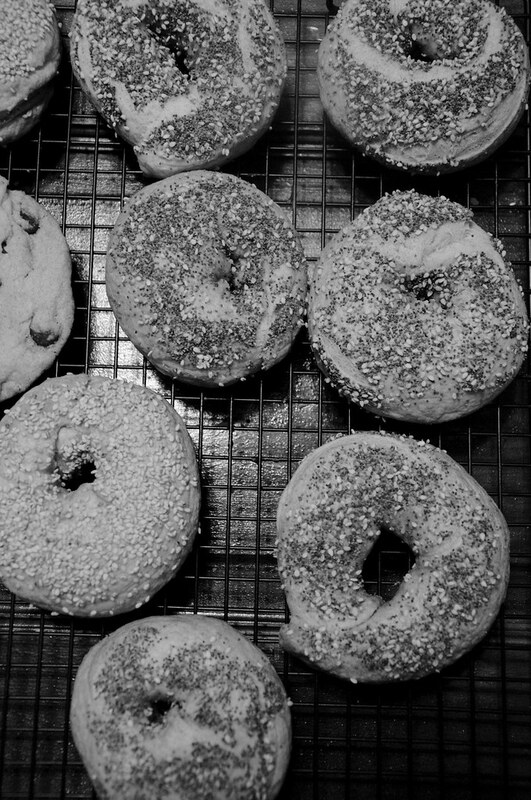 I’ve been making my own bagels for years -- except the actual occasions when I take the time to make them are few and far between. Since I stopped buying sliced bread, I’ve been making more of an effort to continue that trend with other baked goods as well. And if you make them in bulk and freeze, this process is well worth the effort. 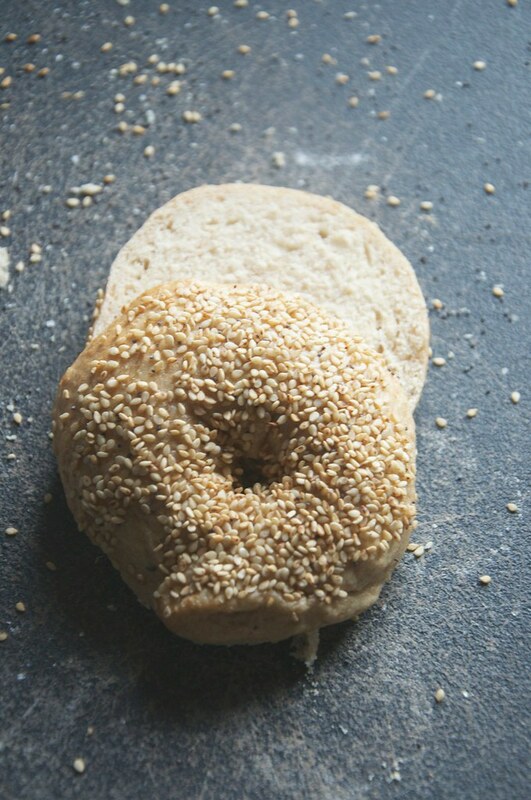 The recipe I follow for homemade bagels is always the same with a few exceptions, mostly with regard to add-ins and toppings. It’s modified from the bagel recipe you’ll find in the Martha Stewart Baking Handbook. I’m hoping to make a few batches of this recipe over the week to freeze (just slice before putting bagels into freezer bags!). Recipe originally posted a while back. Thought it was worth resurrecting. Poppy seeds, sesame seeds, coarse salt, etc. Mixing + prepping the dough . . . In a large bowl, whisk together the yeast and water, sugar and honey. Let stand fo 5 minutes. Toss in the flours and salt. Knead for about 1 minute (until a slightly tacky -- but not sticky -- dough forms). You may need to add more flour or water depending on what you find. If so -- just add in 1 tablespoon amounts. Continue to knead dough by hand for about 5 more minutes -- then transfer to a lightly oiled bowl and cover with oiled plastic wrap. Let rise in a warm place for 2 hours (until doubled in bulk). Divide dough into 8-10 equal pieces. Cover with a damp kitchen towel. Let rest for a half hour. Line two unrimmed baking sheets with parchment paper and set aside. Roll each piece of dough into a 6-inch rope. Form a circle around your hand and then press the two ends (rather, roll them) together to seal. In short: Make a bagel shape and be sure to fuse the ends together. Place the bagels 2 inches apart on the prepared baking sheets. Cover with a piece of oiled plastic wrap (I used the same one from earlier in the process), and let rest while your oven preheats. Boiling + baking the bagels . . .
Preheat the oven to 500 degrees F (260 C) -- with racks in the upper and lower thirds. Then return the bagels to the parchment-lined sheets. 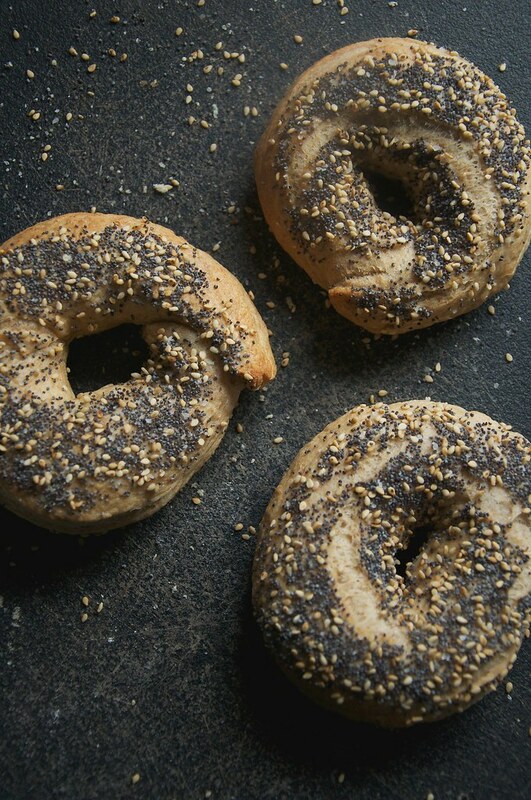 Top them with the seeds or salt -- you must do this when the bagels are still wet so everything sticks to them. When you've finished this process with all to-be bagels, immediately place sheets in the oven. Bake for 5 minutes and then rotate the sheets and reduce the temperature to 350 degrees F. Bake until golden brown, about 10 minutes. Then use a spatula and flip bagels over. Continue baking for another 5 minutes -- or until the back-sides are golden brown as well. Transfer bagels to wire rack to cool. Sometimes I used honey or maple syrup versus molasses. Sometimes I use white sugar versus brown. Sometimes I do all white bread flour or just all-purpose and WW, etc. Sometimes I omit the flax meal entirely. I’ll do plain toppings like just salt, poppy seeds, or sesame. Whatever I toss in, the boiling + baking process is exactly the same. Cover each bagel with foil or plastic wrap. Toast on low to defrost.